For many of us, weekend mornings are sacred. They’re reserved for sleep-ins, crosswords and cartoons. Luxurious coffee sipping and lounging in pyjamas. But for one Red Deer family, these typical activities don’t hold the draw they once did. Instead, the Heiberts and Milners prefer to pack themselves (and a picnic lunch) into their truck and travel 40 minutes northeast to the White Sands area, near the shores of Buffalo Lake. The Heibert and Milner family. Wearing green hats and work gloves, they spend the rest of the day traversing parts of two quarter sections (320 acres or 129 hectares) by foot, and documenting plants and wildlife they see, recording if there’s been any type of destructive activity on the land or to wetlands, and collecting any litter they find. That may be true, but the rewards for this family goes much further than altruism. A few months ago, Kevin Milner was watching television when a piece came on about DUC’s MarshKeepers program. 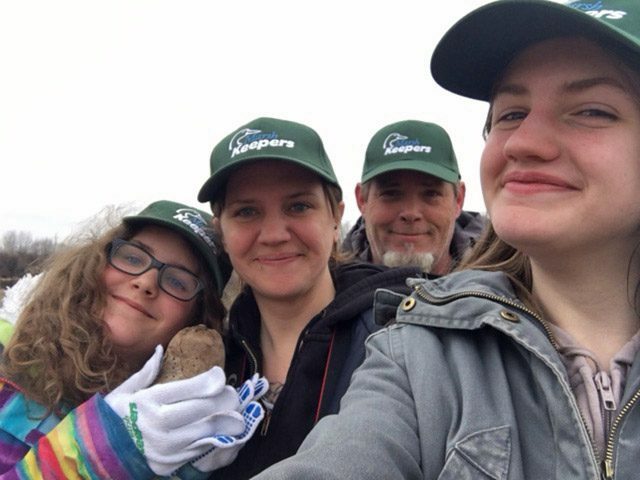 “The TV segment showed what our MashKeepers do, and how they’re helping the DUC mission,” says program co-ordinator, Lee Ann Singleton. 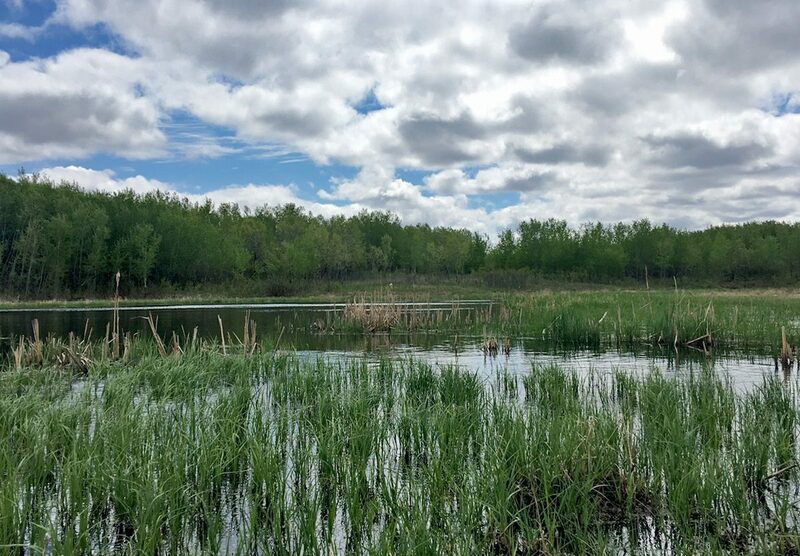 In the province of Alberta alone, DUC maintains over 100,000 acres (40,468 hectares) of wetlands and uplands. These acres provide wildlife with important habitat while also storing carbon, filtering water, and mitigating against floods. “But with just nine field staff—it’s a challenge to regularly visit each project,” says Singleton. So, in 2015, the MarshKeeper’s program was born. MarshKeepers visit nearby DUC land projects and document what they see. They formalize their observations in a report that then gets sent to Singleton. Milner liked the idea of helping safeguard a patch of his province. After discussing the idea with his partner, Brianna Heibert, he registered the family in the program. A few days later, they received four marshkeeping kits—one for each member of the family. “To be honest, I wasn’t sure how the girls would respond to the news,” says Milner. He needn’t have worried. If it was up to them, sisters Kasidee and Kaidance say they’d ditch city life in a heartbeat. MarshKeeping sisters, Kaidance and Kasidee. When the family first began inspecting their DUC land project in the White Sands area, they’d actively explore for a couple hours. Now when they go out, they spend full days in the field. “It’s great to walk around, and get to know each other again,” says Brianna. Unlike in their day-to-day lives, marshkeeping is electronics-free (a rule this family set for itself). They make one exception: the family camera, used to document special moments. Kaidance, 10, is OK with leaving her gadgets behind. “Nowadays, kids are always on their phones or the Internet and they don’t always know about the environment around them,” she says. In the past two months, Brianna’s watched her daughters learn more about their environment, and the value of wetlands. Now when they take their dogs to a local park in Red Deer, they find themselves identifying plant species and waterfowl. Kevin receives lots of positive feedback from friends when he shares how his family’s spending their weekends. “But we’re not do-gooders,” he says. Today, there are 165 MarshKeepers in the province of Alberta. In 2017, they will inspect approximately 55,000 acres. 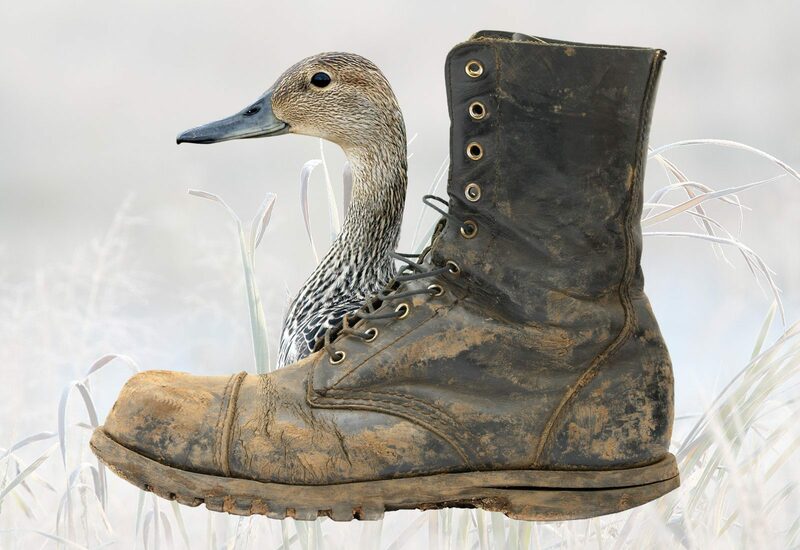 This is their gift to Canada’s wetlands, waterfowl, and all wildlife.